We are just back from a week at Center Parcs (Elveden), glad but sad to be home as we had such a lovely time. A little information, if you’ve never been to Center Parcs – you stay in a villa in the forest, normally near some water. This means that you are constantly surrounded by wildlife in it’s natural habitat. I love it. This week I have hand fed several ducks, ducklings, coots, squirrels and even a deer! As well as the abundance of nature, there is an undercover complex which houses a sports centre where you can go climbing, play badminton, table tennis, squash, bowling, pool, snooker and much more. Center Parcs is also well known for the ‘tropical paradise’ swimming centre. It is indeed a tropical paradise and hours simply disappear once you are inside! As well as a general pool area, there are lots of branches off with varying slides, hot tubs, separate Pirate’s Cove for younger children and 2 outside areas – swimming outside in a forest in warm water has to be done to be appreciated. One of the outside areas is a salt pool which always seems to help my son’s eczema. The other is much warmer and has an area that has a current which leads you to ‘the rapids’ that whizz you around in the fresh air! MONDAY – arrived about 11.30am, unpacked, had lunch, spent 2 hours in the pool, had a BBQ at the villa with family who were also staying. The children were amazed to see 2 deer in our back yard! 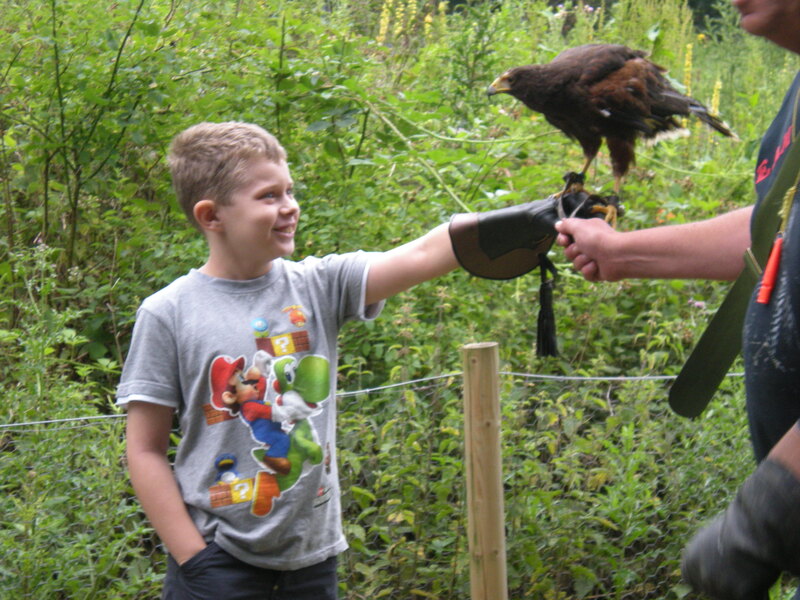 TUESDAY – the children enjoyed a ‘bird of prey’ experience. This was excellently conducted by Keith who introduced us to a range of birds and all the children got to hold them and stroke them. 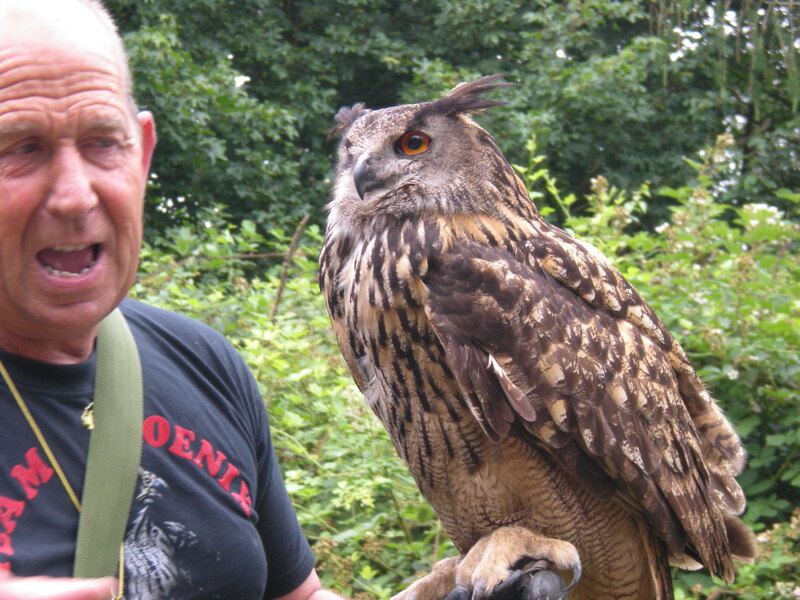 They all loved it and couldn’t believe they’d had an owl, an eagle, a falcon and a hawk on their hand! A massive thank you goes to Keith for an interesting and entertaining display. He clearly loved the birds and they all loved him – he’d raised most of them from eggs so they thought he was their mum! 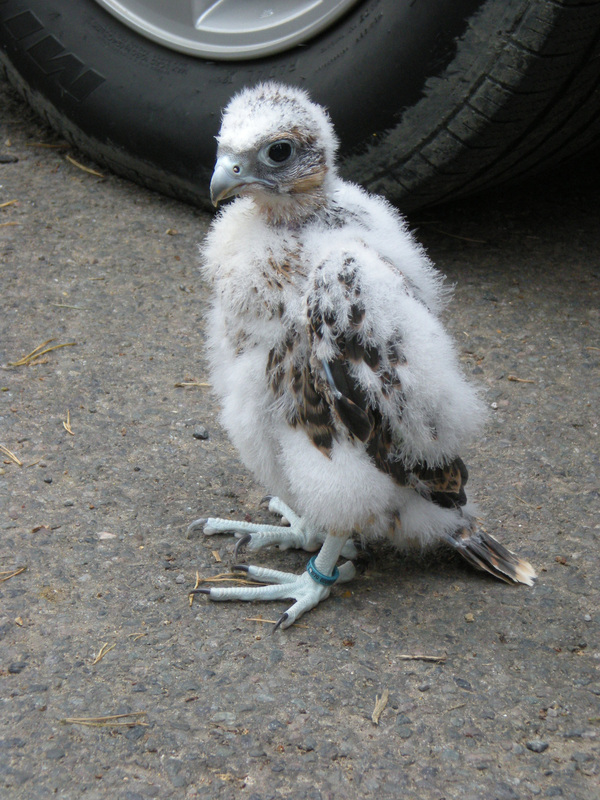 At the end of the display he let us all stroke a baby falcon who he was raising and training. After the birds of prey we had lunch at a Starbucks which overlooked a large lake then headed back to the centre for more swimming. My 2 boys were a bit nervous about their swimming ability before we went, but by Tuesday they were racing us down the rapids without a second thought! Late afternoon we spotted the deer again at the rear of our villa and I wandered out holding a slice of bread, it took a few tentative steps towards me so I crouched down and held out the bread, it took a few more steps and was literally a couple of feet away from me when I threw the slice towards it – it took it and ate it. It was wonderful. It also waited while I fetched 2 more slices for it to eat! Tuesday evening we had dinner in the Sports Bar which is by a large outdoor play ground, the rest of our group had dinner in Cafe Rouge which they also said was fantastic. Compliments to Levi and Kay at the Sports Bar – despite it being busy they were both friendly and very attentive. WEDNESDAY – started off with presents and balloons as it was my brother’s 40th birthday and my nephew’s 10th birthday! Then we spent a few ours in the swimming centre before sneaking off to have lunch on our own while nanny babysat the boys. We went to Bella Italia for lunch where we had really great anti pasta and a cheeky bottle of wine! I’m not 100% sure of the waitress’s name (we think it was Christine) but she also deserves praise – dark haired lady, with a northern accent, very warm, friendly and welcoming. Wednesday night we walked across to the Gastro Pub (Forrester’s Inn) where we again had brilliant service, this time from Gail. Plus great food and wine while the children were able to dive in and out of the play area. I’m not sure my brother appreciated the candle they put into his ice cream but am sure my nephew did! THURSDAY – we filled Thursday with bike riding, swimming, lunch again at Starbucks where we sheltered from a sudden downpour and lots of playing with the squirrels! We had been leaving out monkey nuts for the squirrels and special seed for the birds which they came up to the villa for every day – most mornings when you open the curtains there are birds waiting outside to be fed! 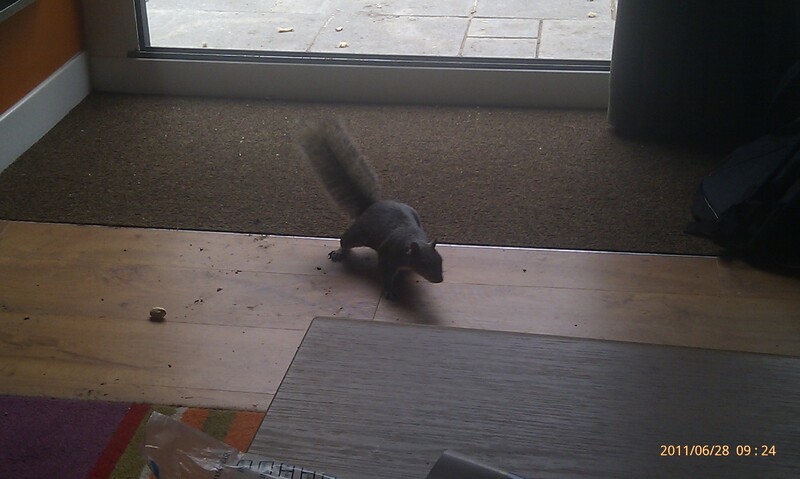 On Thursday we were in the villa with the patio doors open when a squirrel appeared at the door – so we placed some monkey nuts on the floor and he grabbed one and ran off. Almost immediately another squirrel appeared and did the same thing! We put more nuts down and sat back on the sofas to watch. We soon discovered that it was 2 different squirrels, one of them took two nuts each time and shoved them in his mouth before running off, the other very gently took one nut at a time. Thursday night we had dinner at Hucks – great service again this time from Nick (to whom I apologise for calling Frank all night!). We were pleasantly surprised by the quality of the menu, as we had mistakenly thought it was more of a childrens’ restaurant than an adults’ one. The children had the freedom of choosing from a well stocked buffet and then got to play in the play centre while we enjoyed a very relaxed evening. FRIDAY – all packed up and out of the villa by 10am like good holiday-makers – but then we stayed for a few hours in the centre where the children played pool, went on the outside play area and took a last walk around the park. Just before we left the villa, one of the squirrels appeared at the back door, it stepped in and looked around for the monkey nuts – which were all gone! I offered it some bread which it all but sneered at. As a last resort I offered in a chocolate digestive…… it took it from my hand and scampered off with it! We saw it about 20 minutes later at the front of the villa still nibbling away at the biscuit which was almost as big as it was! We had a lovely week. The park is wonderful, relaxing, peaceful and beautiful. The Villa’s are well stocked, comfortable and soon feel like home. All of the staff we encountered couldn’t have been nicer and the facilities are brilliant – there truly is something for everyone. 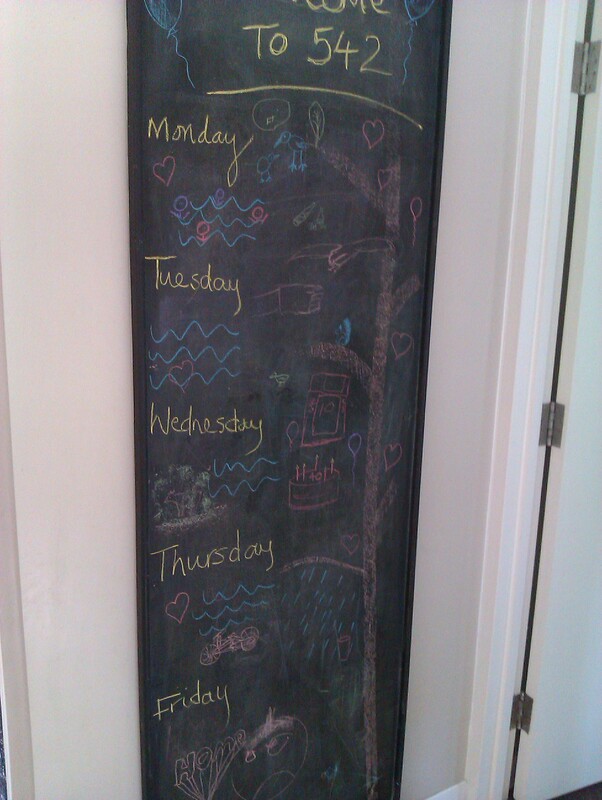 Here is our mural of the week, drawn on the chalk board that is inside the villa! I really would recommend @CenterParcsUK as a holiday, seems to me that it has something for everyone. The staff are all faultlessly polite and friendly. Don’t just take my word for it – take a look for yourself. That looks fantastic. Where’s my fox and my badger?? no I think you will find that it is my fox and my badger!